Save some money with some energy saving tips for your Louisville Home! Own Louisville Real Estate? Our Medley Sokoler Team knows how important it is to save money. That's why we're constantly looking for ways to help you. We put together five tips you can follow to help save energy in your home. Tracy and Larry Sell their Louisville home and buy a new Taylorsville Kentucky home. We love our clients! Tracy and Larry just sold their Louisville home after having it on the market with other Louisville Real Estate Agents for years, They also just bought a new Taylorsville Kentucky home. For more information about Louisville Real Estate or to work with the hardest working Real Estate Team in Louisville Kentucky "The Medley Sokoler Team" head to https://www.weselllouisville.com or call Bob Sokoler (502) 376-5483. The dust has settled and Louisville Home Sale numbers for July 2012 are official! Spurred on by record low interest rates and even lower home sale prices Louisville Homes going under contract last month outpaced July 2011 by almost 29 percent. The number of homes closing was up by 19.44 percent. Average home selling prices were down $2000 from a year before to $177,871 helped assure buyers they were getting a great deal. Interest rates hovering down in the 3.5 percent range helped convince buyers monthly mortgage payments would be low. The good news for Louisville home sellers is that the worst may be over. Naturally no one can forecast the future, but unless the European economy completely collapses, home sale prices appear to have bottomed out. 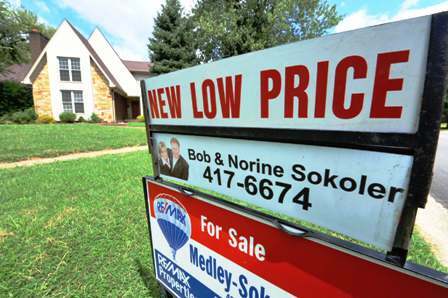 If the national economic forecasts are correct, home prices should slowly start to increase in 2013. Savvy Louisville home buyers are hearing the news reports of a possible increase in housing price next year, along with rumors interest rates will rise after the Presidential elections and they are turning to Realtors to get a perspective on the best areas for housing prices.